Your Move Marcel Pt II, Marcel talks back! As if he was watching from the ether, and having read my last post Marcel seems to want the last word. He can be seen on ‘Great Artists in their own words’ on BBC4 . A bit of a sketchy trot through 20th century art to string together some fascinating little clips and interviews with some of the most famous artists of the last 100 years – Picasso, Matisse, Man Ray, Max Ernst and…Marcel Duchamp. 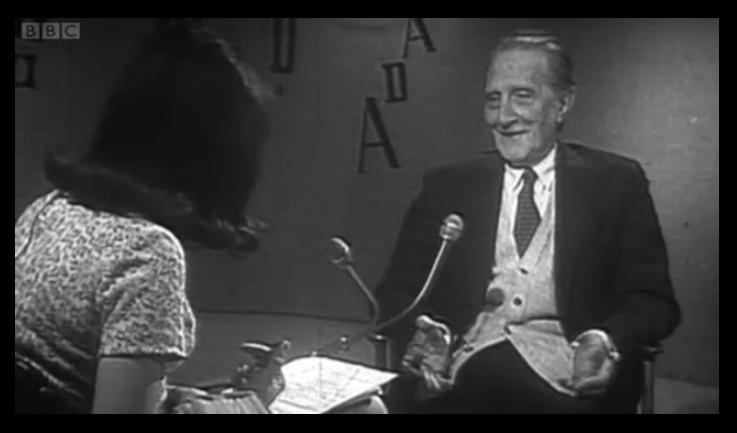 Duchamp is speaking in his remarkably good English to a starry eyed young Joan Bakewell. He exudes a certain laconic, lizard-like charm and unrepentantly flaunts his own paradoxical position. Nothing is of course, revealed, or even clarified much by any of this but it is fascinating. Perhaps his one illuminating remark was to compare art to religion – and to put his R Mutt iconoclasm into that context, shattering and fragmenting orthodoxy without destroying the spark of belief that underlies it. If you’re feeling generous. Man Ray is a bit more forthcoming and less gnomic stating that the early period of Surrealism in Paris had little warmth and no humour and generally de-romanticising the time for those of us who felt sorry we missed it. Thanks, Man. The young Max Ernst looked disturbingly like Marc Almond, but fortunately he grew out of it and went on to get together with Leonora Carrington who is also interviewed. Her profile deserves to be higher, I think. Revealingly Grayson Perry (who always seems like a nice chap) says that ‘We are all children of Marcel Duchamp’, meaning (I think) artists today. He could not be more wrong I think. We are more likely all orphans; desperate for Marcel to adopt us. But he is too cool for that. He preached detachment and he practised it too. And Picasso…well, he is Picasso. More about him next time. This entry was posted in Art, Modernism, Painting, Sculpture, Surrealism, Uncategorized and tagged Art, Duchamp, Matisse, Modernism, Picasso, Surrealism.